Peytyn Willbourn opened Truth in Bronzeville. BRONZEVILLE — Former celebrity stylist Peytyn Willborn has come a long way from her Altgeld Gardens home. 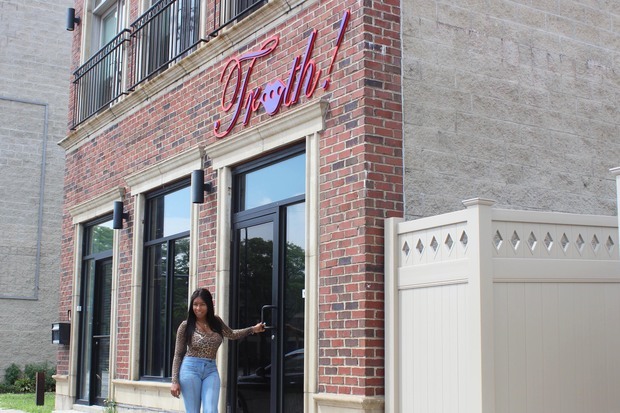 The 47-year-old, who is shooting a pilot for a new reality show and owns three “Kids R First Learning Center” day care centers, recently opened her first restaurant — Truth, an Italian eatery at 56 E. Pershing Road in Bronzeville. When asked if she's had to deal with people who doubted her, she said, “Because you know I had them, don’t you? Because I was a kid from the projects." Willborn has styled hair for American recording artist and entertainer Brandy Norwood, cast members from the HBO drama series "Six Feet Under" and comedian and actress Mo’Nique Imes-Jackson. After years in the hair industry, Willborn was ready for something different. After living in Los Angeles for four years, she moved back to Chicago in 2004 and opened her first daycare. Once her business began to grow and sustain itself, she went looking for another challenge. She said her two children, now 24 and 17, weren’t babies anymore and she wanted something else to occupy her time. The inspiration to open Truth came from a combination of her love for Italian food and recognizing the need to create a space for the 35-and-older crowd on the South Side. The restaurant uses rich, dark hues of orange, red and purple to set the scene. Smooth jazz and R&B plays softly from the speakers during the day then increases in volume and switches to Motown music as the happy hour group slowly trickles in. There’s a full bar, tables, booths and flat-screen televisions. “[Customers] don’t want to leave. When they come, I have to almost put them out,” Willborn said. She described the atmosphere as a home-like feel where people can freely socialize. “You know how you go to the house, and you’re kicking it in the backyard, having fun with people you know? It’s like that,” she said. Willborn said patrons won’t be disappointed in the menu, which she entrusts to her executive chef Larry Pierce, who has been in the food business for more than 30 years. The two most popular dishes are the chicken scarpariello and the shrimp francese, she said. 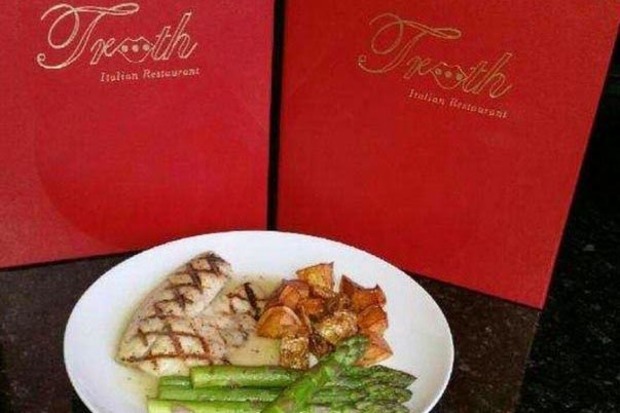 Truth Italian Restaurant, 56 E. Pershing. Grilled tilapia in vesuvio sauce. Pierce, who specializes in Italian food and graduated from Le Cordon Bleu, said his dishes are unique. Other dishes include wild salmon or tilapia that comes grilled or sauteed and served with sauteed spinach, asparagus or herb potatoes and a choice of pasta. Veggie dishes include fried zucchini, marinated kale and more. Pierce met Willborn through a mutual friend and he said the two hit it off immediately. He said the two make a good team: “Peytyn brings them in, and my job is to keep them,” he said. Michelle Williams, 54, who has lived in Bronzeville for more than 40 years, said she’s pleased to see Truth in the neighborhood. “I’ve always wanted something that would keep me from going to the North Side or Downtown, and this helps the community by bringing funds to it,” she said. Sheila Curney, 63, agreed: “We’re starting to see the community grow, and we’re looking for places like this where we don’t have to go outside the community,” said Curney, a business owner. She said she wants to support more businesses in her own community. “I think this is just a beautiful place. This is the type of place that we’ve been looking for, a place where we could come and visit, bring customers, friends, do events for our own businesses,” Curney added. Willborn wants to offer the community space to host events and parties. The restaurant’s outdoor patio will be done before the summer ends. The two-story building has open lounge space with a balcony that people can rent, along with rooms such as the “red room” and “white room” for private parties. They can inquire about prices. Truth is open Monday - Friday 4 p.m. to 2 a.m. and Saturday and Sunday from 12 p.m. to 2 a.m. Reservations can be made by calling 312-715-8796.